As we age, we require support for continued Brain Health. 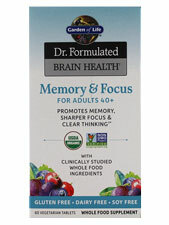 Dr. Perlmutter created this unique formula with clinically studied Organic Grape Extract, Organic Wild Blueberry Extract and Organic Whole Coffee Fruit, plus essential nutrients and good fats, providing healthy individuals with necessary support for the brain, promoting clear thinking, sharper focus and improved memory. Clinically studied Organic Neurophenol Grape and Wild Blueberry is shown to help healthy individuals improve memory, focus and retention. Clinically studied Organic NeuroFactor Whole Coffee Fruit is shown to increase levels of Brain Derived Neurotophic Factos (BDNF) - a protein that creates new neurons. Warnings: As with any dietary supplement, consult your healthcare practitioner before using this product, especially if you are pregnant, nursing, anticipate surgery, take medication on a regular basis or are otherwise under medical supervision. Keep ouf ot reach of children. Additional Info: Made in the U.S.A. Do not use if safety seak is broken or missing. Contains 2mg of naturally occuring caffeine per serving. Suggested Use: Adults take 2 tablets daily with food.